In our youth many of us loved to visit theme parks with their precarious, spine-tingling rides of terror. It was cool to be scared and come out safe and sound at the other end, before heading back for another go. It’s got me thinking about the religion of my youth. I reckon it was a roller-coaster ride to beat all roller-coaster rides. The big one where Cosmic powers laid down the tracks of my life, taking me on a topsy-turvy spin of life and death. I guess I’d better explain. I got on the roller-coaster when I was converted, when I bumped into the Divine at the Theme Park of Northern Irish religion. now at the time I believed that God was the owner of the Park, but I was mistaken. Like me He/She was just visiting, looking for lonely souls like myself, a Divine pick-up if you like. 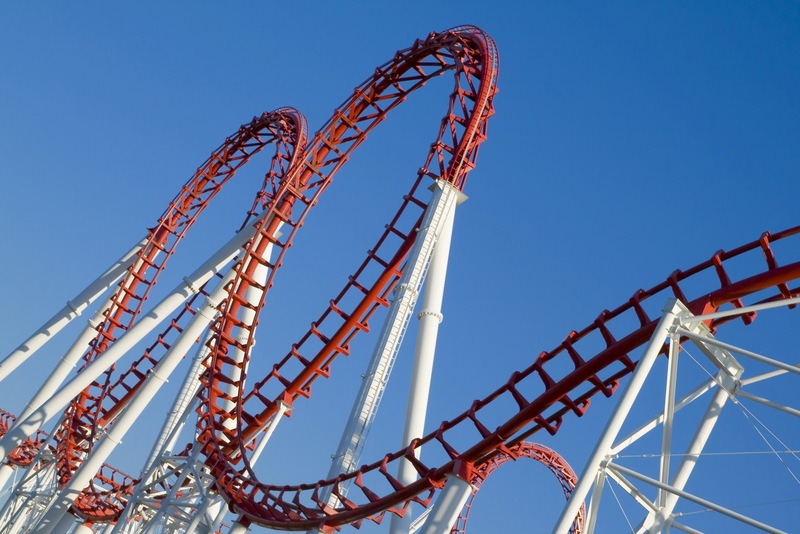 No, I was quickly ushered onto the Charismatic/Evangelical roller-coaster ride, not by Divine Love, but by the ride operators at the Park, the teachers of a faith, full of excitement and thrill. At first things sped along nicely, as I ate my Bible snacks on a daily basis, drinking from the fizzy fountain of answered prayers. Just around the first bend though, things started to pick up. We weren’t on this ride for fun, rather we’d been recruited by the Divine, who incidentally was wistfully watching from the sidelines, for the Battle of all battles, the titanic struggle of Good v Evil, or Jesus v Satan. My wee psyche had inadvertently been hijacked for a cause, one that had strapped me in for the long-haul, by the vows of group commitment. For beside me, to the right and to the left, were my brothers and sisters, those fellow warriors who joined me in the cause – an army we were told that would storm the Gates of Hell. Boy, was that a rush. One mass of screaming solidarity flying around our God ordained track of Spiritual Warfare. We couldn’t lose with God on our side or could we? Of course we had some wonderful ups along the Way, when we glanced far below the Face of Divine Love, smiling at us. Unfortunately we mistook this for Its approval, rather than the compassion that awaited us on our dizzy return. Anyway, it was an adrenalin blast, as we danced, sang, spoke in tongues and fell on our faces in the frenzy of devotion. And there sitting in front of us were our elders, who’d ridden the ride for many years, knowing each twist and turn, stoical in their steadfastness and control. All we had to do was copy them and everything would be all right, as we soared into the very heavens of God. Of course, the downers followed the ups. There were casualties as we peaked and headed down into the tragedies of life at lightening speed. No matter how euphoric the ride, things got messy at times, both personally and collectively. We were bombarded by the fiery darts of the Evil One as we attempted to claim Northern Ireland for Jesus, through the cries and screams of intercessory prayer. And boy, did he pack a punch, knowing how to hit us in our spiritual solar plexus. Depression stalked our downward path, yet we cranked up and efforts and prepared ourselves for the next upward surge of Spirit. The Sunday sermon told us that it wasn’t an easy ride following Jesus, and so it proved, though not for the reasons that the preacher promoted. For a ride with Jesus and the Devil wasn’t a bed of roses, one that we could easily escape from. If we jumped, Evil had won and we’d pay for it for the rest of our lives. If we stayed we pleased Jesus but had hell to pay. I managed to stay on the ride for 16 years or so, before I was pushed off , so to speak. Having lost my firstborn son Ben, to cot death at 5 months, I began to doubt the supposed All Powerful Designer of the Ride. Yet, even this wasn’t enough to have me get off the Revivalist track. It took some plain old rivalry with my leader friend to have me finally pushed off, an act of unintended mercy, that paradoxically saved my future, psycho-spiritual bacon. And of course, there was God standing by the kiosk of Compassion, granting me all the time necessary, for my cold-turkey detox from the adrenalin-fuelled track of Revivalist religion. Eighteen years later, it was time for us to be reintroduced. Not on the Fairground Rides of Programmed Religion, but in the aching emptiness of a human heart. And so it has continued, a courtship of Aloneness, a Union in the fields of Self, far from the victory screams of Satan-obsessed souls. 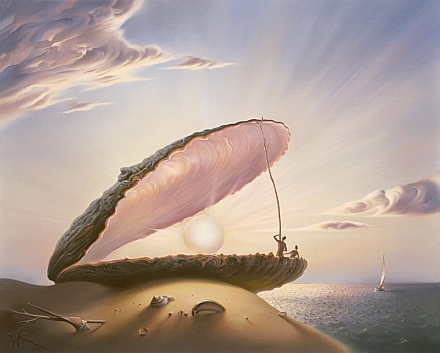 Tucked away within a slime covered oyster, one lying in the murky depths of the swirling ocean, lies a pearl of great price. The divers of indigenous peoples take their life in their hands to dive deep to bring to the surface these watery treasures, for sale and display. Likewise it takes a level of daring for us to enter the murky depths of our inner world to discover what lies beneath. It’s a dive that many of us refuse to take, particularly, may I tentatively suggest, those of us who claim to follow the Nazarene. Within the confines of both conservative and progressive belief systems, inner diving is looked upon with great suspicion. Labelled as a form of self-absorption, a wasteful narcissism, we’re advised not to dabble our toes in the waters of Self. For the conservative disciple, Jesus/Yeshua, is all we need. We keep looking outwards at mental projections of his death and resurrection, believing that we’re somehow saved from an eternity outside the reach of God’s love. Of course a measure of inner knowledge is occasionally suggested, but it refers only to the indwelling Spirit that has somehow come to take up residence within the faithful believer. Now where exactly Spirit is believed to have settled isn’t really explained, with both soul (psyche) and spirit (ours) bandied around as religious buzz words without any real explanation. No, the emphasis is primarily one of relating to an external God, One who is somehow out there. Mission, the evangelisation of others, is the overarching goal of the conservative believer, with very little time left for Self exploration and inner knowledge. Brainwashed that such introversion is for the selfish New Age types, the pearl is left to sit within the encrusted shell of ego, our wounded and dare I say it, unhealed psyche-soul. For the progressive too, the inner search for meaning is also a somewhat Don Quixote waste of time. Rightly believing the Nazarene to be a revolutionary of the scapegoating social order, the Progressive sets out of a Love mission to show the compassion of God to others. No airy-fairy pie-in-the-sky love for the Progressive, but a practical siding with the victims of society in a sleeves rolled-up kind of way. For the Progressive the Nazarene is to be found in the tear-stained face of others. A vital part of the salvation narrative but not the whole story. For the Progressive the inner world is one of angst and pain, the drivers of their compassion for wounded others. Yet, they too seem reluctant to explore their own inner world, preferring to explore the inner world of others instead. Much less painful and perhaps much more ego boosting. No, the Progressive follower of the Nazarene tends to see the Queendom-Kingdom without, in the mess of the here and now. The realm of Divine Love within is one that is believed but not really sought. More important things to do in our earthed, yet partial take on the Nazarene and his message. Both religious tribes tend to view each other with deep suspicion while leaving the inner journey thing to the mystics of other traditions. Such inner travellers are viewed as a bit of a waste of space and those to be pitied with their tales of self-knowledge and an inner Presence. 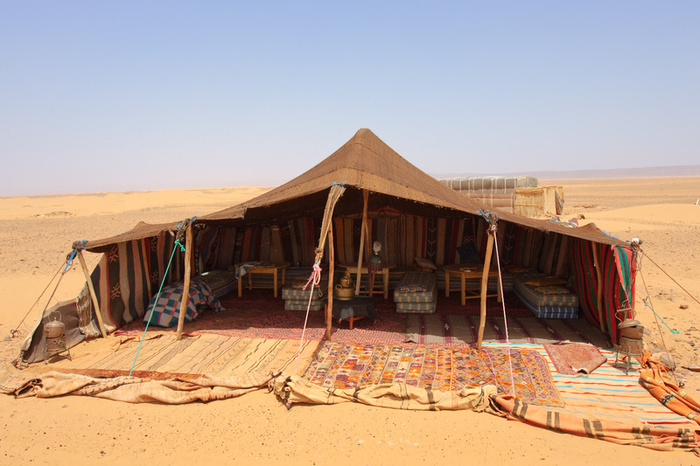 Get into that stuff too much and you’ll soon be living at the top of an Egyptian desert pole or, more likely, taking a much-needed break in a mental health institution. No, let’s face it. Inner knowledge isn’t top of the Yeshua followers to do list. Best left to the Mind, Body, Spirit brigade and their supposed, uncaring narcissism. And yet, the divine portal, the pearl of the human spirit, still lies deep within, growing and crying out for expression. And expression it will eventually get. When the masks of ego fall away during the performance we call life, when the slime of our shell-like ego is washed away in the storms that beset us, when something breaks within, opening the clamp-like grip of our psyche-soul to reveal a touch of Source, the divine deposit that makes us who we are. Our authentic self, that part of us untouched by pain and struggle, that centre that flows into the Energy of God. Silence and reflection as we lie on the Divine Psychiatrist’s couch, willing to meet our shadow Self with all its warts and deep felt pain. A passer-by on our journey Home, one we can’t ignore but need to embrace as we walk towards the Light. Such sessions aren’t the result of strenuous Self-Improvement effort but the co-operation of a psyche-soul that knows the time has come to relinquish control. The day of ego has passed and Divine Love begins to do its healing, yet painful thing. Is it any wonder that we keep busy with Jesus? Better an outside Saviour than one who walks with us through the valley of psyche-soul, the valley of death into the pastures lands of spirit-Self and Divine Love. Now where did I put that mask? John, the disciple beloved by Yeshua, had a great way with words, and an equally shocking take on the transcendence of Divine Love. In this post I want to look at this revealing little passage from the Johannine spiritual tradition. This declaration by John would have freaked out both the Greek philosophers and the Jewish theologians of his day. The Tao (Chinese) or Logos (Greek) referred to the transcendent organising principle of the cosmos to all who used the terms. An unseen mystery whose effects were only manifest in the visible world of Nature. Both the Chinese and Greek philosophers believed that this living force or energy underpinned all the material world, an ocean of sorts upon which the ship of our space-time world floated. It saturated the visible realm of all living things like water in a freshly drenched sponge, yet remained a teasing mystery to the mind of man. John shocks us by suggesting that this Tao-Logos became flesh, in other words took on human form, or more startling become one of us! The Intelligent Mystery that upheld all things somehow poured itself or himself into a human being, in a unique Way. The Presence of the Tao-Logos camped among us in human form. There is something very daring in such a risky venture on the part of the Source of All. How can the Divine Wisdom limit itself to an individual human Being. Stepping into the apparently dangerous, skewed world of form seems like a ludicrous plan for such an all-encompassing One. Why the visit? Why the intimacy of a shared human experience? The Johannine writer suggests that those who brushed up against this incarnated Tao-Logos were unknowingly given a chance to observe at close quarters the very manifest Essence of the Divine visitor’. In some strange way, the Tao-Logos could be observed face to face, rather than the rare glimpses that it previously revealed to the spiritual seekers of all cultures. The Shekinah Cloud of Presence that had previously visited Solomon’s Temple on rare occasions had now moved into the earthy area of human existence. Yet, unsurprisingly such a Presence was missed by the majority of the crowd, content to play the old religious games of their Jewish forefathers. The glory or shining of the visiting Tao-Logos was in some way unique. Not the reflected glory of all those made in the Divine image, but the glory of One intimately in on the God thing before the beginning of space-time. One birthed in some mysterious Way by the Creative Father Source outside the limitations of material cause and effect. One in companionship and partnership with the Divine Cause of All. A co-worker in the hilarious Dance of Creation and Being. One there to enjoy relationship within the Mystery that we call God. So what of the nature of the One who birthed Nature? The flow of Life known as the Tao-Logos knows only one direction, viz. that of giving. Secure in its own Being it pours out its Divine energy into the fabric of All Things, us included. A non judgemental Presence whose only aim is to heal and restore the psyche-soul of mankind. Once we come to the liberating realisation that Truth is not a set of beliefs our world is turned upside down. To discover that the Tao-Logos is just not an impersonal force as in Star Wars, but a Presence that manifested itself in the person of a Man, is a psycho-spiritual shock to our systemized world view. That which was Mystery has made the quantum leap into humanity to demonstrate its Nature in a way that we can easily understand viz compassion and unconditional love for the creation it has birthed. So, if we wish to discover the invisible Tao-Logos, or Way-Word for ourselves, let’s look no further than the Nazarene, Yeshua Bar Yosef. In observing him, we may surprisingly get in touch with our own inner chamber, our sacred space within where the Mystery of Mysteries has also come to dwell; the Spirit Breath that unites us with the timeless Life Flow between Father and Son.